HuffPost has launched a tiered membership program called HuffPost Plus, asking readers to support the media company’s journalism and get exclusive access to newsletters and other content. HuffPost will not put up a paywall, “because we believe our journalism should remain freely available to everyone – not just those who can afford to pay,” editor-in-chief Lydia Polgreen wrote in a post on the HuffPost site announcing the program. The membership provides readers with a way to support HuffPost’s coverage, Polgreen said, spanning politics, entertainment, civil rights, social inequality, the environment, parenting, relationships, money, wellness, work/life, food and style. This year, HuffPost is focusing on coverage of the road to the 2020 U.S. presidential race, as well as LGBTQ issues, racial equality, parenting and mental health. 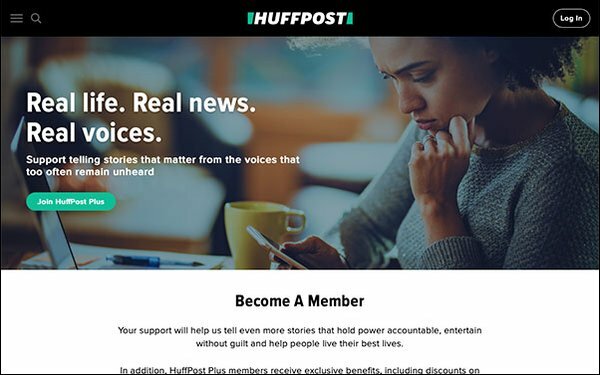 A membership program is a smart way to monetize and engage deeper with HuffPost’s huge audience: about 116.7 million people come to HuffPost’s site on a monthly basis. The brand is part of Verizon Media’s portfolio (formerly Oath), which also includes Yahoo News and TechCrunch, among others. It also marks the first of many upcoming steps HuffPost is taking to diversify revenue under Charlie Wilkie, the company’s new Chief Revenue Officer. He took on the role in January. HuffPost Plus will have three levels of membership. Readers can register on the site for free by logging in with their email to sync their bookmarks and manage the HuffPost newsletters they subscribe to. A monthly membership will cost $5.99 a month. Readers will get access to exclusive newsletters, an ad-free experience on the HuffPost app, and discounts on HuffPost merchandise. The first weekly member newsletter is focused on parenting, a “deeply engaged” HuffPost audience of millennials, Polgreen said. A HuffPost Insider newsletter will offer members a behind-the-scenes look at HuffPost’s reporting on its most popular stories. An annual HuffPost Plus membership will cost $99. Superfans will get an exclusive, limited-edition “People Before Power” T-shirt, in addition to the other benefits. Events and other opportunities to interact with HuffPost journalists are potential avenues for the membership program’s growth. “We will see which areas [our audience] particularly wants more from us and lean into those. We are on a journey with our members too,” Alex Wallace, general manager of news, entertainment and studios at Verizon Media, told Publishers Daily. Polgreen wants the HuffPost member community to serve as a mode of communication between brand and audience, a way to listen to its most engaged audience for feedback on what they want to read. When HuffPost was testing the “log in/sign up" widget at the top right of the page, thousands of users registered with their emails without realizing a membership program was launching. Those readers consume six times as much content per visit on HuffPost’s site. This is a big brand initiative for Polgreen, who took on the role of editor-in-chief two years ago, after stepping away from a successful 15-year career at The New York Times to replace founder Arianna Huffington, the sole editor of The Huffington Post since its launch in 2005. Polgreen oversaw the rebranding of HuffPost soon after. When Polgreen became editor-in-chief, she created the “Listen to America” bus tour. A branded HuffPost bus visited 25 cities in the U.S. to find out what were the “important issues on the minds of Americans,” she said. HuffPost interviewed over 2,000 people during the tour, and those interviews served as “a blueprint of the agenda for HuffPost." Polgreen reorganized the newsroom around the topics that came up during that tour, hiring full-time reporters to cover healthcare, affordable housing and voting rights, and launching HuffPost Life to double down on service journalism. Separately, brands like The Guardian have successfully asked readers to contribute support for editorial initiatives. The publisher announced last year it now receives more revenue from readers than from advertisers, with over 500,000 readers globally who support The Guardian monthly — either through a contribution or subscription.